“Shooting a political drama is not going to be without its practical obstacles. I have spoken to people who have asked me not to use their names or not to include facts they have told me. I began to realise when people told me their phones had been bugged that what to me seemed like a story, was real life for many people – real life with serious consequences that were still ongoing. This wasn’t just a film, it represented important real events in many people’s lives. Many thousands of people had died – had been killed – as a result of these facts we were trying to tell. It should come as no surprise that we were stopped and searched a number of times in London, even though we have always had all the correct permits. The first time, Alex the First Assistant Director was practically jumped on by an armed response unit when he was seen by MI5 crouched behind a wall with a walkie-talkie. But the most dramatic moment of the shoot came when the police detained us in Rome. 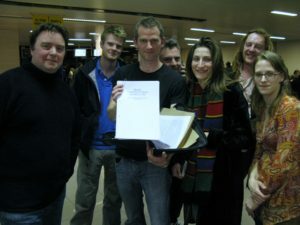 The prop briefcase carrying copies of the real documents used to show Iraq was buying Uranium was opened at the airport and we were promptly arrested. I was questioned in a room of ten Italian detectives, exaggeration though that may sound. What struck me most of all about the encounter was the intensely grave looks of all the other men in the room. Something very serious had clearly happened. I wondered what that was, and then realised it was us. The two greying detectives who did the questioning demanded to know who I had met in Rome, why I had confidential Niger documents about Uranium and if I worked for MI6. Unbeknownst to me the efficient Art department had placed not only the uranium documents (which anyone can download off the net) in the briefcase, but had also mocked up a whole raft of authentic looking MI6 forms with serious titles like ‘Non-Disclosure Secrecy Waiver’, as well as a copy of The British Government’s Weapons Of Mass destruction Dossier. No wonder the Rome police thought they’d got the real thing. Ironically, with all this damning paperwork I realised my claim that I was just a film maker sounded incredibly feeble. I offered to prove my story by showing them the footage we had shot. But when they brought the camera bag into the room and I opened it all the tapes were gone. They just looked at me. The reason why became apparent later when I spotted Steve Buckland the DOP and he silently mouthed to me ‘I’ve got the rushes’. Terrified that our three days hard work was going to be confiscated Steve had secreted the rushes on his person and a friend he had in Rome was now speeding to the airport to spirit the rushes away to safety before the police got hold of them. Fortunately I found one tape still in the bag and loaded it into the camera to playback. Of course, given the style of the film the whole thing was shot like a surveillance tape – which unsurprisingly only seemed to reinforce the police’s point of view…. Just as I began to wondered if Christine, the producer, had put any figure in the budget for ‘bail’ I found footage of the clapperboard and the police finally believed me. After all, it was unlikely a set of secret agents would call “Action’ before tailing someone through the streets of Rome.